Garlic breath. Whether you're on a date or about to give an important presentation, that strong odor can be hard to get rid of. But now scientists say that there is an easy remedy: Milk. Researchers at Ohio State University have a study in the Journal of Food Science that found both fat-free and whole milk reduced the concentration of the chemicals of garlic that make it smell so strong. Water was the major component of milk responsible for deodorizing the smelly remnants of garlic. Because of the fat content, whole milk worked better than fat-free milk. Adding milk to garlic before ingesting it was more effective in deodorizing a person's mouth than drinking milk after eating garlic, the researchers found. "Ingesting beverages or foods with high water and/or fat content such as milk may help reduce the malodorous odor in breath after garlic ingestion and mask the garlic flavor during eating. To enhance the deodorizing effect, deodorant foods should be mixed with garlic before ingestion," the authors Areerat Hansanugrum and Sheryl Barringer wrote. 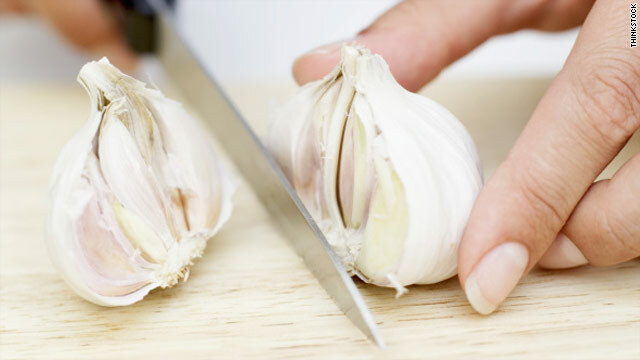 There are plenty of health reasons why you shouldn't let bad breath keep you from eating garlic. The vegetable has been suggested to have protective powers against cancer, urinary tract infections, and colds. Or just stop eating garlic. umm... who cuts garlic with a knife?! As every cook knows, parsley is the key. It gets the odor off your fingers after cutting and it gets the odor out of your mouth if you add it to the dish. Yeah, I don't get the milk advice–milk breath stinks almost as bad! garlic breath is the best breath. Garlic milk. Somehow there are a lot more tasty combinations using garlic, than having your garlic with milk. Hey another thought: get everyone in your group to be eating garlic too! That way no one notices! So then how do you get your breath not to smell like spoiled milk. Milk's pretty gross anyway. Except the article says that milk worked because water was the main component. Why not drink water? If water and fat were the key, couldn't you just drink a glass of water and have some dessert to wipe out your garlic breath? Drinking milk will just give you that nasty spoiled-milk breath anyway. I have run cunmomity ultrasound services in two GP health centres since 1996.These are excellent services backed up by audit on both clinical ouctomes and patient and GP satisfaction questionnaires.We have now been informed we must become AQP by 1/4/2012.There will be some benefits in doing this but this will also possibly increase prices if we go to a national tarriff.I have several concerns and would like to be able to discuss thse with some-one and as I have had 16 years experience doing this (think we were the first to do cunmomity based ultrasounds) I feel I have much to contribute. This milk "remedy" is not very likely to help: The primary reason garlic causes bad breath is that garlic, like onions, contains a number of sulfur chemicals that are responsible for the flavors in garlic, onions, shallots, and so on. Some of these are known as mercaptans, a class of sulfur-containing compounds that includes the rotten-egg scent that is added to natural gas and the chemicals responsible for the odor in skunk spray. After eating garlic these compounds are metabolized and passed into the blood, along with other sulfur-containing by-products. These compounds are released from the blood into the lungs during breathing, which accounts for the long-lasting "garlic breath." So, drinking milk, brushing your teeth, eating mints or chewing gum will only mask the garlic odors briefly. Since the chemicals that cause garlic breath are actually being released into the breath by the lungs, the odor will return once the milk, gum, mints, etc. have "worn off." Also, it's probably not the fat in milk that reduces garlic breath temporarily; it's more likely milk proteins, which can bind the sulfur chemicals and "neutralize" them. So, go ahead and eat garlic, and if you're worried about your breath, stock up on Tic-Tacs! Way too much information but your heart is in the right place. why eat garlic BEFORE going out on a date, or a business meeting. Drinking milk while eating garlic will cause your stomach to explode. Mythbusters: disprove that one! I ll still eat garlic and lots of it... I like milk too but fat free. If you dont like it, mind your own bizness. "The vegetable has been suggested to have protective powers against cancer, urinary tract infections, and colds." Have you learned nothing from Twilight?! None of the usual stuff works on modern-day vampires. Perhaps they'd run if you showed them a picture of Bela Lugosi. Who the heck mixes milk into their garlic before eating it..mmmm milk in your marinara sauce. I love the smell of garlic. Milk is alright but I prefer beers with my whole cloves. Only drink small amounts of soy milk due to the fact that the soy bean has nuratal chemicals that are poisonous in large amounts. I would recommend Lactaid milk or a brand like it that's made for lactose intolerant people. As a few others have pointed out, poorly written. "Water is the key component, so obviously whole milk, which has more fat, is more efficient." I presume the writer meant to say that the fat in milk is the key component. Even housholds in remote villages of India knew this. Thanks for proving that right. Even today, garlic, boiled in milk, is an unmatched remedy to gastric issues. Could anyone do a research on this? Milk does nothing. If you have garlic breath eat a spoonful of tuna and wash it down with onion juice to mask the smell. But who wants to kill the garlic flavor in food?! I don't mind a date with garlic breath, it usually means he took me out to a good Italian place, or I cooked for him and he liked it. Besides, if you find garlic delicious, chances are you're not too turned off by the odor. I am going to have to go ahead and disagree with you on this one, garlic breath doesn't originate from the garlic itself or the stomach or tongue, it comes from the lungs, and no amount of milk is going to change that. Useful for mosquito repellant and helps make personal room when in crowded public spaces. Don't knock those love apples. Have the researchers talked about any (adverse) interaction of milk and garlic components? Does the anti-cancer effect of garlic remains even after interaction with milk components? What if you are lactose intolerant, like me?